As a multinational Swedish manufacturer of plastics compounds, we have left yet another successful year with increased growth behind us. 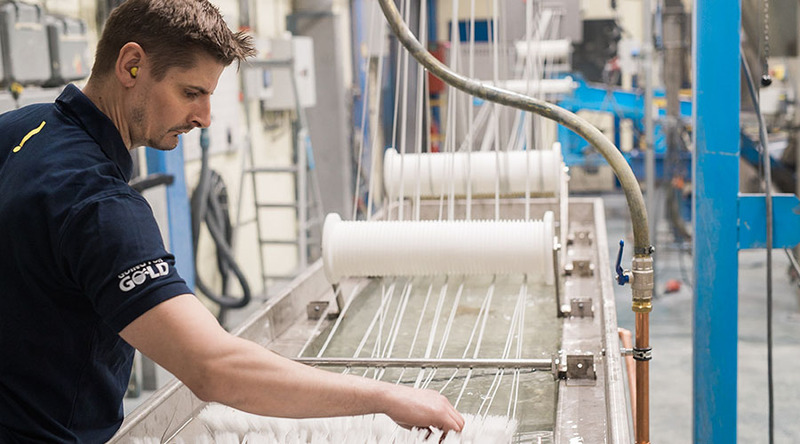 We have invested heavily in new machines, product development and an expansion of both staff and premises. In 2018, the trend is still positive with more exciting news and a grand 50th-anniversary celebration to look forward to. – 2017 was a very good year for Polykemi with excellent volume growth throughout the Polykemi Group, says Mattias Persson, sales manager at Polykemi. The growth is a result of the commercialization of many new projects in recent years as well as a strong global market. A direct effect of the increase in sales and production last year is that in the Swedish part of the Polykemi Group, about 20 new staff were employed and a major investment was made in the expansion and renovation of office space and laboratory in Ystad. Polykemi also invested in three new extruder lines, two of which replaced older existing models. As planned, the investment has led to improved efficiency and increased production capacity. – We are planning to invest in another three new extruder lines in 2018, says Mattias Persson. I predict that the strong international market will persist and we expect further growth with increasing volumes during this year. We see a continued strong demand for reinforced PP compounds and technical plastics like PC/ABS, PC/ASA, PC/PBT and PA. In addition, Polykemi celebrates its 50th anniversary this year, concludes Mattias Persson.